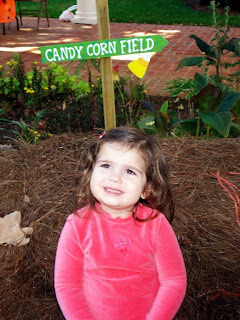 Today we visited the pumpkin patch at Jamestown UMC. It's the same one the kids and I visited last year. For $2 the kids get storytime in the hay, a tractor pulled hayride, and a little pumpkin to take home! We had a great time and the weather was beautiful! I only wish Hayden could have been there but he's having fun in school. We will be going back as a family I'm sure! 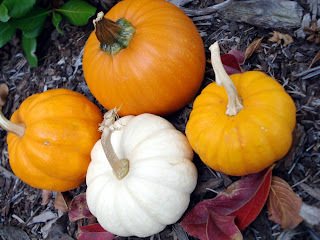 Here is our little collection of pumpkins! Aren't they cute?! Here is Halle gearing up for storytime on the haystacks! Here is Ella in the middle of the patch. I have the same photo of all three kids during their first visits to the pumpkin patch! 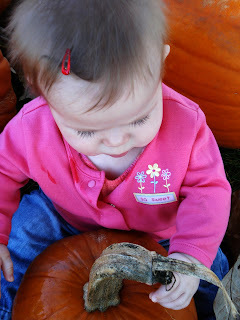 Looking down at the pumpkin with their eyelashes fanned out across their cheeks! 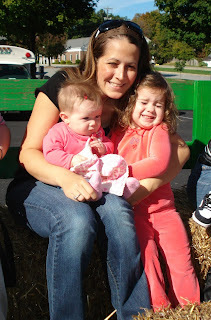 Here is a not so flattering photo of me and my girls on the hayride. Notice that Ella is the only smart one! While Halle and I struggle to open our eyes Ella looks the other way and avoids the glaring sun altogether. Oh, and brilliant me with my sunglasses on top of my head! Pure genius! you ladies are too cute! The pumpkin patch is calling our name!